Noble Skiodo, one of the leading Online players, revolutionizing TV viewing experience in India with its high-end technology at budgeted prices & also exclusive Technological tie-up with Skiodo Inc. from Silicon Valley, breaks new ground with its first Curved 32” Curved TV ‘32CRV32P01’, that blends the exciting new look combined with the high quality which you expect only from Noble Skiodo TV, all at budgeted prices. Now is the time to upgrade yourself and offer an immersive experience that comes in premium finish and curved aesthetics, that fits perfectly into your interior. It’s beautiful to look with its sleek bezel design and finish, but even better to watch. 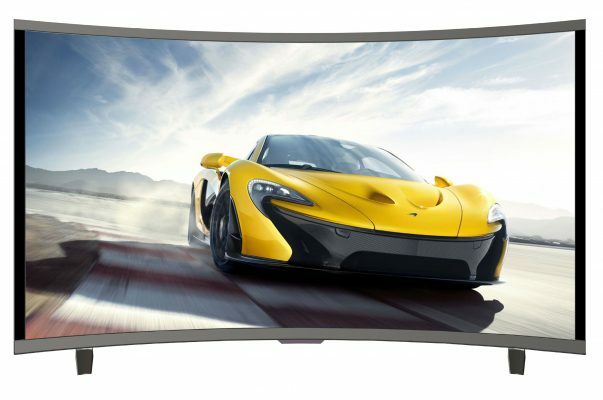 High Definition viewing: Enjoy the greater feeling of depth in HD display resolution of 1366x786P, this Curved TV gives you a crisp & vibrant picture quality. Flat images shall be life like with Noble Skiodo’s auto depth enhancer. The gently curved screen, shall give you uniform and balanced viewing from 360-degree perspective. Equipped with an advanced Anti-Glare 0 Dot Panel, this curved TV delivers the most stunning visuals with colors richer than ever. See the finest picture quality, depth and detail from every angle. Dynamic Sound quality: Complementing the superior picture quality are the Dual 8W speakers integrated within the TV that delivers a surpassing audio output making your picture come alive. Feel the difference with the blasting surround sound & choose from 5 different sound modes to get the most out of TV. Extensive Connectivity: With 2x USB ports, you can connect your USB Drive and portable hard drive at the same time and enjoy unlimited entertainment with movies, photographs, songs and more.Thanks to the 2X HDMI Input you can now watch your favorite television channels and play on your favorite gaming console without having to switch cables constantly. Environment Friendly: In our endeavor to better future, the Curved TV is completely free from lead and other hazardous materials & also is energy efficient that helps you save on your monthly electricity bills. It’s time to open a whole new window to the world, with superior technology with Noble Skiodo. Paired with 12 Months Warranty, the product is already available exclusively with Amazon in India.